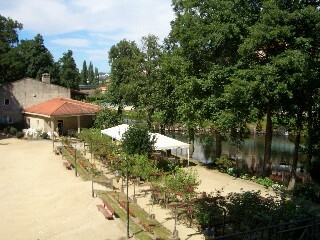 Allariz is a large town with a significant old quarter about 20 minutes south of Ourense city. It is easily and directly reached on either the A52 or N525. The town starts at the bottom of a hill where there is a river, a park, the alameda and a water mill, along with a couple of eat-out bars (one on the river bank). From there it climbs up an incline to a plateau above where there is a monastery, a church and the second main area of the town. We parked at the foot of the Allariz, walked over the river bridge and then negotiated our way through a maze of small, narrow and winding cobbled streets that make up much of the original old district. 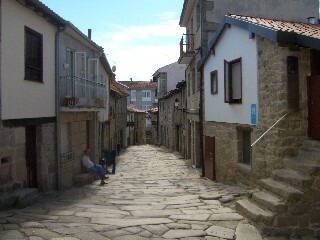 This part of the town occupies quite a steep slope with a number of medieval looking buildings, some terraced and interconnected and the addition of the occasional small square and traditional Galician church. The walk is pleasant but steep and this old quarter has a definite character to it. 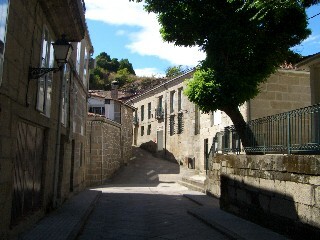 A number of the houses have galeria balconies and the stepping effect, as they climb and wind around the hill, is typical of the best of Galicia. What this part of town does lack, no doubt because of the slopes and inclines, are any little bars or cafes, these greet you when you reach the summit. Once at the top of the town you are on level ground with most of the more appealing and traditionally styled Galician granite buildings now lying below you. This second level of Allariz is however busier and at its centre is a large, but not overly attractive monastery. 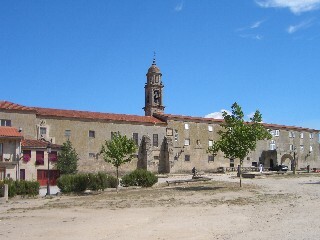 The appearance of the monastery is not helped by its setting behind a large open and dusty car parking area. This was further devalued during our visit by the presence of a make-shift stage and lighting rig that prevented a clear view of the building. Both were there for a night time concert that evening. The monastery is not open to visitors and is still actively in use, but there is a tiny museum within it that you can visit free of charge. The artefacts on display are however very limited. Also at the top of Allariz, and next to the monastery, is another church and this one is certainly slender and elegant to look at. 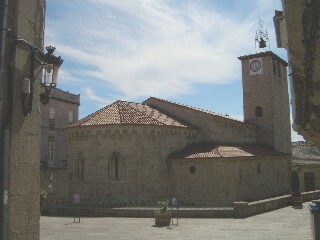 There is also a stone cruceiro to the church's side. Facing the monastery and church is an arced parade of buildings with some bars and shops and this area was quite busy and certainly gave the impression of being the hub of the town, at least as far as locals were concerned. I really liked this town, particularly the old quarter on the steep slope, but the monastery was slightly disappointing and a bit bland to look at. 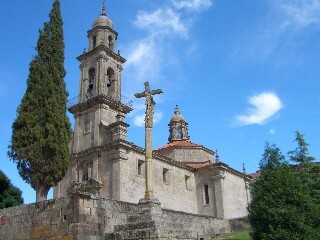 As with many of the towns in Ourense, Allariz is somewhat distant if you travel from Pontevedra and even more so from la Coruna or the north of the Lugo province. That said, Allariz is what we would class as a good punctuation break, or one of a number of towns to visit if you decide to take a mini tour around Ourense. As a one off stop, or day out in itself, it might prove slightly lacking, but when combined with other similar towns it would happily fill a couple of hours. There are a few more photos on the next Allariz page. Use the button at the top of the right margin.